After two years of legal paperwork, a single, solar-powered flashing light will be installed this weekend (July 31, 2014) on the hulking remains of a quarantine station in the Cape Fear River. Ed Pierce was piloting his motorboat on the night of Aug. 4, 2012, when he gave wide berth to an approaching tugboat. He inadvertently slipped out of the shipping channel and crashed into a 16-by-16-foot unlit concrete platform from the long-abandoned structure near Southport. His wife and partner of four decades Barbara, 55, was killed. Pierce and two other passengers were injured. 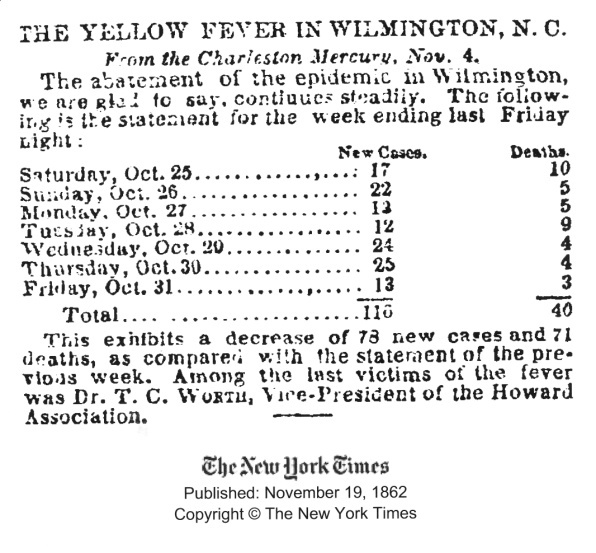 At last November’s Monthly Meeting , Jack Fryar talked about the yellow fever epidemic in Wilmington in the Summer and Fall of 1862. 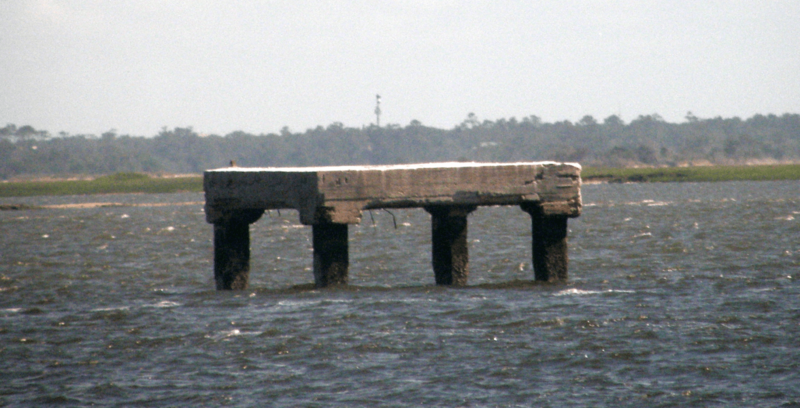 But did you know that you can still see a concrete platform from the old quarantine station that was built in the very middle of the Cape Fear River? Can you imagine what it must have been like to face a host of deadly diseases like small pox, typhoid, yellow fever, cholera and even malaria without having any idea of what caused them or how to treat the people who caught them. The ONLY thing that could be done was try to prevent the scourge from somehow coming to your town. In 1348 the first formal maritime quarantine was established in the Mediterranean, when Venice created a system whereby an appointed council of three had the authority to inspect ships, cargoes and individuals for up to forty days. In 1403 Venice established the first known maritime quarantine station or lazaretto on Santa Maria di Nazareth an island in the Venetian lagoon. By the 1700’s all major towns and cities along the eastern seaboard of the US had passed quarantine laws though they were generally not enforced unless an epidemic appeared imminent. As early as 1751 the North Carolina colonial assembly passed a Pilotage Act that required inspection of all ships coming into harbor. However, again it appears to have been “selectively” enforced for Wilmington suffered yellow fever outbreaks in 1819 and 1821. Then came the Civil War blockade runners and the worst epidemic Wilmington would ever see. Thousands fled the city and over 600 people died. Until the end of the war the blockade running ships were stopped at Smithville (Southport today) or Fort Anderson for inspection and fumigation. Soon after the war North Carolina law provided for a port physician to draw up quarantine regulations and by 1879 the president of the State Health Board could appoint two additional physicians to a local quarantine committee. 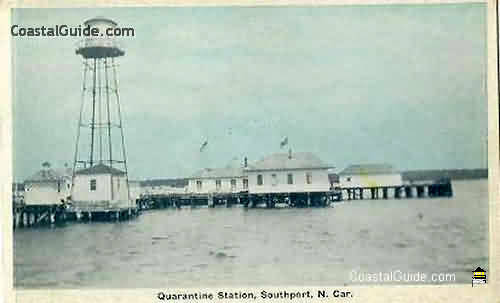 Dr. W. G. Curtis served as port physician from the mid 1870’s to the 1890’s during which time the quarantine station stood on the waterfront of Smithville. But the locals blamed the station for several epidemics in the area and when the waterfront station burned in 1883 locals lobbied to have it moved further from town. Then, in 1893, Congress established the U.S. Marine Hospital Service and construction of a station in the middle of the Cape Fear River opposite Price’s Creek was begun. It opened in 1897. By 1901 quarters had been added for sailors waiting for their ships to be inspected and by 1904 there was a hospital for sick seamen. By the 1930’s developments in public health found the facility in the middle of the river obsolete and in 1937 it was no longer being used though a custodian was still looking after the buildings. In 1953 the buildings burned to the ground. However one small concrete pad remains and can be seen from the Bald Head Island Ferry soon after it leaves Southport. For more detailed information on the Cape Fear River quarantine station, read Ben Steelman’s Wilmington StarNews article (June 8, 2012.) about the quarantine station. Much of the station was destroyed by fire in 1952. Hurricane Hazel in 1954 finished off what was left, except for the water tower platform. Basil Watts, a pilot in the Cape Fear River for 28 years, said the platform “acts as its own marker” for a debris field of concrete and steel from the collapsed station. Submerged pilings remain as well. “You’d have to remove all the debris to make the area safe,” he maintains. … full story ..
After two years of legal paperwork, a single, solar-powered flashing light will be installed this weekend on the hulking remains of a quarantine station in the Cape Fear River. Since that day, Pierce, with the assistance of Wilmington attorney Geoff Losee, has been working to have the structure illuminated in an effort to prevent a similar tragedy. .. full story ..